Created in 2004, The Edge by Rocky Patel remains steadfast one of the hottest brands sold on the market today. Our online cigar store here at Smokers Discounts offers two distinctive wrapper styles of these hand-rolled premium cigars. The Edge Corojo, with its robust and spicy Cuban-seed Corojo wrapper produces a rich, medium-plus flavor, while the full-bodied The Edge Maduro features an oily Costa Rican wrapper. Each of these premium cigars are individually handmade and rolled in Honduras, infused with aged ripened Nicaraguan and Panamanian fillers, sealed with Nicaraguan binders. The smoke from these amazing premium cigars gives a rich and flavorful taste from first draw to its full finish with notes of dark spice and espresso. Stock up your humidors with these masterpiece hand-rolled premium cigars. 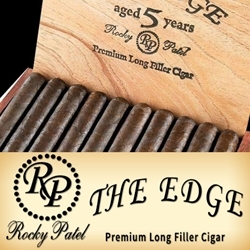 Smokers Discounts has made it easy and affordable to buy Rocky Patel The Edge cigars. A variety of sizes and flavors are listed below. Each of these styles are in stock and available today at a low discount price. Call us for more details!